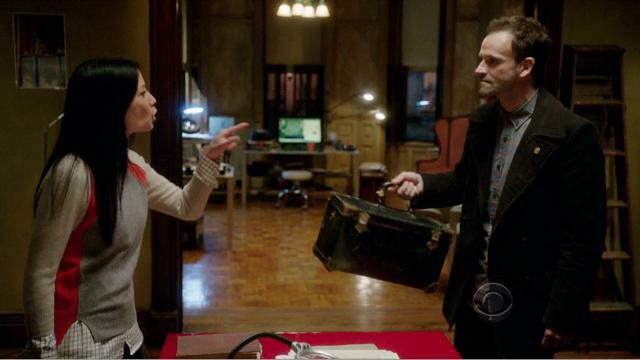 The six weeks are up for Dr. Joan Watson (Lucy Liu) to be the Sober Companion to Sherlock Holmes (Jonny Lee Miller). If Elementary had not been picked up/been a flop, M. would have been the end of the series, which is why we get not one, not two, but three Canon references. Apart from that, M. is a showcase for the actors and for screenwriter/Elementary creator Robert Doherty which gave us a thrilling, tense and fast-paced episode that allowed for a greater exploration of the characters. We begin with a man creating an elaborate method of killing a victim. Not even the Arsenal game can completely distract him from his mission. While Watson wants to have a conclusionary dinner with Holmes as something of an exit evaluation, Holmes being Holmes has no interest in this. He does have an interest in the crime Captain Gregson (Aidan Quinn) brings him. To Holmes not-so-secret delight, he recognizes the methods of the killer. It is a serial killer from London named M. For over ten years he has killed 37 people of all stripes and persuasions, with nothing to connect them. Holmes had assisted in investigating these crimes, but at a certain point his drug addiction took complete control and he became pretty useless. It looks like Holmes is again too close to the case. Gregson suspects that there is a Holmes connection to the case that Holmes at first dismisses. He also has an ulterior motive for solving this case. There is conflict galore with this case. Watson struggles with ending her time with Holmes. She has come to enjoy investigating crimes and is conflicted about leaving. When the victim's body washes up and she is able to place the location of where it was found, she says, "I'm going to miss this," which catches Holmes' attention. Holmes has his own conflict. He, via a previously-undisclosed hidden video camera system, has the first known photograph of this M. He does not turn this evidence over to the police because he wants to catch M himself. This M had killed Irene Adler, the only woman to stimulate him intellectually as well as physically. He has no interest in bringing him to justice. He is going out for revenge. Holmes will cross into the Dark Side, pledging to torturing and then killing M.
Watson is horrified by all this, and more horrified that he got teens to serve as "irregulars" to his own version of a police force. With the evidence his secret youth branch brings him, Holmes is able to find M. just before he strikes again (where again M is in the grip of Arsenal football). M is surprised to see Holmes, but Holmes now is an avenging angel. Watson and Gregson are able to put together where Holmes went to do his evil deed, but they are not there. However, we discover that M is really Sebastian Moran (Vinnie Jones), who has been a paid assassin for another M, a mysterious figure named Moriarty. This Moriarty admires Holmes, but Moran insists that he didn't kill Irene Adler. He can prove that he wasn't her killer because he was imprisoned at the time for having assaulted a Manchester United fan. The killer was a copycat, and Moran is insulted that Holmes and Scotland Yard couldn't figure that out. Moran now thinks that he was set up by Moriarty. Moran knew nothing of Holmes' move to New York and thinks that Moriarty sent him there so that Holmes could track him down and kill him in turn. Now he wants to get even. Holmes eventually (after extracting his metaphorical pound of flesh) turns Moran in, and claims Holmes used self-defense. However, it is a hollow victory because Adler's killer is still out there. It is here that Holmes tells Watson, "I'm going to miss this" when she offers a helping hand. Watson contacts Sherlock's father, a certain M. Holmes, to stay on. M. Holmes turns her down but she lies to Sherlock, saying he agreed to have her continue at his side. M. ends with Sherlock Holmes now focusing on a new enemy...a certain Moriarty. M. is full of M's: you have the assassin Moran, the master criminal Moriarty, and Holmes' father, who is M. Holmes. In the case of the latter, there's nothing to specifically state that he is Mycroft Holmes (who in The Canon is Sherlock's older brother). Lest we forget, M. is also the French equivalent of Mr. It could be Mycroft, but it could also be Monsieur. Granted, a stretch but for the moment a perfectly acceptable usage. What M. also has is a brilliant turn by Miller as Sherlock. He is for once someone not driven by solving the puzzle but by hatred, revenge. He is full of righteous fury, one who is frightening in the lengths he will go to for vengeance. His scenes with Jones show a hard, angry man blinded by the passions that overwhelm him. For once, Sherlock Holmes is not the cold, logical thinking machine. He is a man, a wounded man, a man who will extract a painful price for having The Woman removed violently. However, when he realizes that Moran, who as M really had nothing to do with Irene Adler's disappearance (since I'm convinced she is still alive somehow), the genuine conflict and emotional crisis is both frightening and heartbreaking. Director John Polson did a brilliant job in not focusing on Miller's face as the truth slowly unravels before Holmes. Instead, he allows for Miller's voice and body moments to show the emotions, which only serves to heighten the intensity of the situation. Polson and Doherty also allow for both Watson and Gregson to be able to show that they can deduce things perfectly on their own. It is Watson who with the clue of the chalk on one pair of shoes deduces where Holmes has taken M to. It is Gregson who thinks that M might be targeting Holmes. Sherlock, had he not temporarily lost perspective, would have been proud. Again, we get great nods to The Canon, which curiously might have gone unnoticed. Though never overtly stated, the young kids Holmes hires to check out the hotels M might be in are the New York version of the Baker Street Irregulars (it might have been nice that they had been named as such and we hope they come back for other appearances). Perhaps because the material the killer used at first looked like a firearm, I figured it was Sebastian Moran, the second most dangerous man in London. With the introduction of Moriarty, we now have a full-fledged Sherlock Holmes-based series rather than just having Sherlock Holmes in New York. M. is a simply brilliant episode with great performances by the leads, a story that crackles with excitement and suggests that The Canon will make greater appearances in Elementary. Any fear that Elementary would be in the shadow of the BBC's Sherlock are now rested. It is now its own being, a separate entity that will work within the CBS style of procedural while also making The Canon an important guide to the series however long it lasts. meet the new kids in town.